Still alive and kicking. A multi-dimensional, no-rim-clearing, taste-like-Cab, well-balanced and elegant middleweight treat! A perfectly balanced complement to the mixed-greens, bleu-cheese, pear, pecan, and grape tomato salad that went along for the Sunday night palette-ride… I was concerned that it might have outlived its peak and I would have to move on to a different bottle, but I was graciously mis-concerned. The last time I had one of these was Spring 2003 at ‘South by South Wine Five’ (SXSWV). With serious competition in attendance, it was one of my favorites that evening. 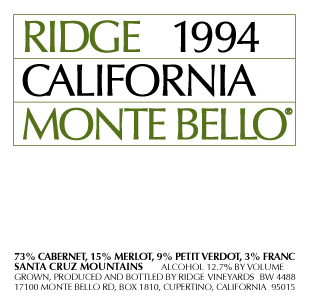 I’ve always considered Monte Bello to be graceful, complex, and characteristically unique. They are consistent. Paul Draper makes pure brilliance beyond Zinfandel and truly deserves the respect he receives. The Slow Food Movement and the days of yesteryear leave me wondering where I can get the perfect tomato. Could it be in my small, local market where the producers reflect generations of commitment to the land and devotion to the processes that yield the greatest achievements in taste? No, the baseball-glove skins of those little guys can’t be ignored with any amount of salt sprinkled on, but luckily Austin has Central Markets and Whole Foods to fill the food-shopping void. Tasteless, soul-less, and loveless tomatoes live meaningless lives all over, but not in my kitchen. Everyday, a tomato is raised in-kind to meet my personal standards of yumdom. It’s like a University of Tomato process that most tomatoes only dream about attending. The xenophobic and rubber-skinned tomatoes of Central Texas needn’t bully the tasty foreign fellas into extinction. There is a tomato to suit every palette with the perfect tomato experience. The night’s early hours seemed to forecast doom. Pretensions were abound and the constant up-sells were helping the Melting Pot lose credibility. I wondered if this location had opened its doors for the first time that morning, but later discovered they were into their first ½ year stretch. After reservations were delayed for 20 minutes and a move to our 2nd table, we were seated in the bar area (basically onstage with no privacy-“I forgot my ukulele at home”) with 1 burner to serve our food-heating needs (“Nobody brought an extra camping stove, either”). We needed a 2-burner table. Upon reaching our 3rd table in half an hour, we seem to be planted. A sip into the 2001 Norton Malbec, the night finally began to sail. I had spotted the 2001 Gardine Chateauneuf-du-Pape on the wine list to keep in mind for the evolving arsenal, so the evening could only get better. Our waiter eventually calmed down, found his groove, and let us just ‘be’. Great conversation proceeded to drive our meal. Talks of San Francisco and Missoula. Talks of life in general. In the fondue-ring, we had the battle of the meats versus the fish. I wasn’t sure how we would all move from the cheese course to the salad to the fondue-ring, as we all seemed to fill-up, but we were all strong. We knew we could do it. As the early part of the evening drifted from our minds, it became a good night. We were celebrating the birth of a life. We were celebrating proposed matrimony. I always find the focus of food, wine, and conversation to be clear, when left to its own accord, in a simple and warm way.